8 years of designing apps and websites. Q: How to I add news sources to the app? R: Just go to the Set Feeds page of the app and allow an update of the sources. The app returns the searches for the RSS feeds and you may select all you like. After selecting the sources, you must click the Finished button. Q: How to I add a custom RSS source? R: Go to the Set Feeds page of the app and click the Add new button. After that, enter the url of your RSS feed and add a name. Hit Add RSS feed and then hit Finished. Q: How can I report a non working feed? R: If a feed is not working or is not pulling content you may report this to us by selecting the Report broken feed button from the menu options of the app. An email with details of the broken feed will be send to us. Q: A feed is not working. How do I fix it inside the app? R: If a news source is not working anymore, you should first report to us, by using the option from the app menu. After a while, you should then go to Set Feeds screen and allow an update of the sources. Any updates we make to the broken feeds are listed in that page at the Latest Updates line. Click Done and check if the feed is working again or come back later to the same screen to check again. The next version of the app will automatically update the broken feeds without you having to do anything. Q: An article is not well formatted for mobile view. How can I see the original page? R: If the system of formatting a page for easy mobile reading (without the heavy and slow loading) is not working properly, you may hit the button for viewing the original page that is floating in the bottom of the app. Also, you may read the article in an external browser, if you select this option from the menu of the app. Q: Should I enable ZOOM option from the app configuration screen? R: We recommend using the Allow Zoom option to view articles that do not have mobile format or cannot be properly formatted for mobile view. Q: What if I have other questions or some recommandations? R: You may write to us at any time to our email address: tallsnail@gmail.com. 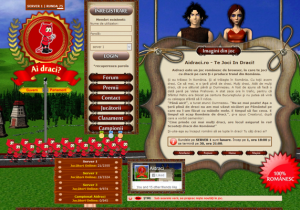 Aidraci – Our original and most succesful browser game developed for the the romanian market. Thousands of players and long term fans over almost 8 years of activity. For more details or to submit a proposal, please Contact Us.